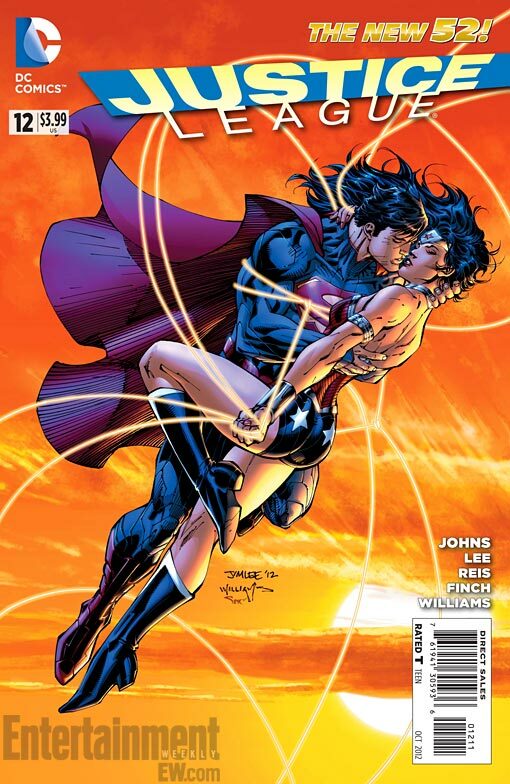 This week's issue of Justice League, being promoted primarily as a hook-up between Superman and Wonder Woman that takes place near the end of the issue, provides a lot of closure to the series' first year and a lot of information about the coming year in the series, not least of all because Geoff Johns has returned to an old storytelling device that he loved so much on titles like JSA and Booster Gold: that final page of "coming this year" teases. So what did we find out from the issue? Rumors in the last few weeks have seen Aquaman penciller Ivan Reis step off that title to take over Justice League, a series that DC's co-publisher Jim Lee is currently drawing. Rumors up until recently had been that Lee would like to relaunch WildC.A.T.S., a series he created twenty years ago when he left the big two comics publishers to co-found Image Comics and which DC took possession of when they purchased his WildStorm studios from him. Earlier this week, though, new rumors came to light that Lee might be taking about six months off from monthly art chores in order to get a leg up on a new Superman series he'll be launching with Batman scribe Scott Snyder. 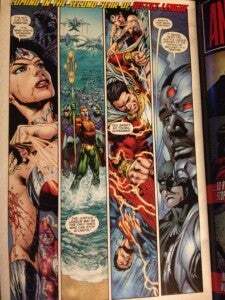 All along, the only name associated with taking Justice League over should Lee walk away was Ivan Reis, the longtime collaborator of Justice League writer Geoff Johns on Green Lantern and Aquaman.--and now it's Reis who drew that final teaser page. "Coming in the second year of Justice League" indeed." 2. Now we know whose side Shazam is on. In the four-page Trinity War spread that filled the DC Comics Free Comic Book Day issue, we saw what appears to be a war between the Justice League (led by Superman, Batman and Wonder Woman) and the soon-to-be-launched Justice League of America, led by Steve Trevor and a group of heroes somewhat more comfortable with brutality and combat tactics. Some of the characters, though, particularly those on the edges of the combat, weren't fighting anyone in particular, or were fighting with characters not yet associated with either team. That left a number of fans scratching their heads as to what was going on, and even this week when Justice League of America was announced, it was still unclear for whom certain characters were fighting: "What's going on with Shazam and Deadman? And why are Hawkman and Green Arrow fighting each other? Is that even Shazam, or really Black Adam?" Two of those questions appear to have been answered, as the teaser page shows someone in red, clearly Shazam, duking it out with Superman while Wonder Woman attempts to restrain him. That seems to suggest not only that Shazam will be fighting alongside either the JLA, or the Trinity of Sin, and against the Justice League, it also seems to suggest that the black-garbed version we saw fighting Deadman was likely Black Adam. It appears that, at some point during the year, Aquaman will lead the forces of Atlantis against the surface world and that it will be up to his allies in the Justice League to push him back. Between Avengers vs. X-Men and Trinity War, though, excuse me if I don't get all excited about another storyline pitting superheroes against one another. This could be any number of things--Batman and Cyborg say they've discovered a traitor, reportedly after opening the ranks. Given that we see Hawkman and Green Arrow fighting in the Justice League vs. Justice League of America brawl, it could tie into that, with one of those guys being a double agent. It could also be Aquaman, given that we've seen above that he'll be a thorn in the League's side at some point this year. The most likely scenario, though, probably involves the Brother Eye Satellite, which plays a major role in today's Justice League International Annual #1 and which Batman and Cyborg are meant to be overseeing. Given that the JLI annual characterizes a possessed O.M.A.C. as a traitor in the team's midst, it wouldn't be the first time. ...or at least it starts that way. Green Lantern #13 features the new Green Lantern, Baz, facing off against the Justice League, who are reportedly looking for Hal Jordan. While it's likely we'll see exactly what happened to him, or at least some pretty strong hints on the matter, in the Green Lantern Annual today, in Justice League #12 (which takes place at least before the events of Justice League International Annual #1, and probably before any of the annuals) we see Hal willingly taking some time offworld to tend to other Green Lantern Corps responsibilities and to allow himself to be scapegoated for the League's very public in-fighting during the conflict with Graves in the last couple of issues.